Humans are creatures of habit in what they do and they operate most efficiently on a number of synchronized physiological cycles and psychological patterns, especially on meet day. Some cycles are so deeply imprinted that they are difficult to alter, but many can be changed by merely adjusting daily habits and routines. General eating patterns of meal times are a good example of cycles that can be easily adjusted and re-patterned quickly. However, events out of the ordinary tend to disrupt cycles and can cause consternation and worry. Meet day should be an exciting time for you and your athletes. If not, your team runs too many races! Besides excitement, race days also reveal apprehension, doubt, anticipation, and anxiety. Race days also bring a break in the daily cycles of the cross country runner. Sometimes the cycle break is not drastic. For example, if one is used to practicing each day from 3 to 5 pm and the cross country race is run at 4:30 pm, then the break in routine may not be much of a concern. However, if the race is run at 10:00 am on a Saturday, then the runner has many questions for you. What time should I get up? What should I eat? When should I warm up? The coach can field lots of questions that can be answered by simply setting up a pattern of behavior that the team follows for every race, regardless of the day of the week, or the time of the race. Done even a few times, the runners on the team develop a familiar pattern that leads to consistency. Preparing for a cross country race begins far earlier than the night before when it comes to maintaining the athletic lifestyle, and that should be emphasized daily with your athletes. However, for purposes of discussion, the night before will be when specific race day preparation begins. The obvious preparation should be a time of a hearty carbohydrate meal and lots of fluid early in the evening. There are enough calories in a can of soda and half a candy bar (not recommended) to easily run 5000 meters, so over-eating should not be done, and neither should over-drinking of fluids. Not only will a full stomach and bladder disrupt sleep patterns, over-drinking water may cause a dilution of sweat in the body which could cause hypnatremia and the athlete may wake up with a headache due to slight brain cell swelling pushing against the cranium. There is too much water in the organism at this point. It is suggested through many scientific studies that an athlete should wake up at least four hours prior to aerobic competition. Travel could complicate this wake-up time even more. The runner should count back 8 ½ hours from the anticipated wake-up time to determine the proper time to go to sleep the night before. After getting up on race day it is time to consider food intake. The blood glucose and stored glycogen in the liver and muscles should be high after last nights meal and a long nights sleep. Any food taken in prior to a race held before noon will be to relieve any pangs of hunger. This small amount of food and drink should be carbohydrate rich but not very high in carbohydrates such as in soda or candy. A sport bar, bagel, rice cake, or piece of toast would be recommended. Eat no fat, protein, or drinks with lactose or citric acid in them. No matter what the time of the meet is, plan to arrive about 90 minutes before the start of the first competition. This will give your team members time to select a camp and erect a tent or lay out a tarp. The available bathrooms should not be too crowded this early in the process. The coach can get maps and explain the course in a relaxed way. Warm-up should begin 70 minutes from the time of the start of the race. Walking the course is not recommended as it makes it seem so long. Running in large groups is not recommended either because too much socializing detracts from noticing landmarks on the course that should be used while racing. Groups of 4-7 should warm-up together. Begin with a two mile jog of the course. Stop at this point and do some very light static stretching to improve range of motion in the system. The last mile should be considered active, which includes some light bounding, skipping, side-running, and other favorite drills. The runners should plan on finishing the routine about 20 minutes prior to the start of the race. Spend the next 10 minutes putting on spikes, preparing gear for the starting line, and getting last minute instructions from the coach. The last 10 minutes should be spent alone at the starting line doing stride-outs, very active mobility drills, and same light jogging. Sport drinks should not be consumed within the 70 minute warm-up routine. Some water is fine, but do not let the runners over-drink unless it is a very hot and humid day. Figure 1 shows the effects of both water and a carbohydrate sport drink (CHO) on the glucose volume in the blood (Ackley 2009). Water or sport drink were consumed 60 minutes (-60) prior to aerobic exercise start (0). In the sport drink group, the glucose volume increased dramatically in the blood and then decreased rapidly as insulin triggered a storage response. 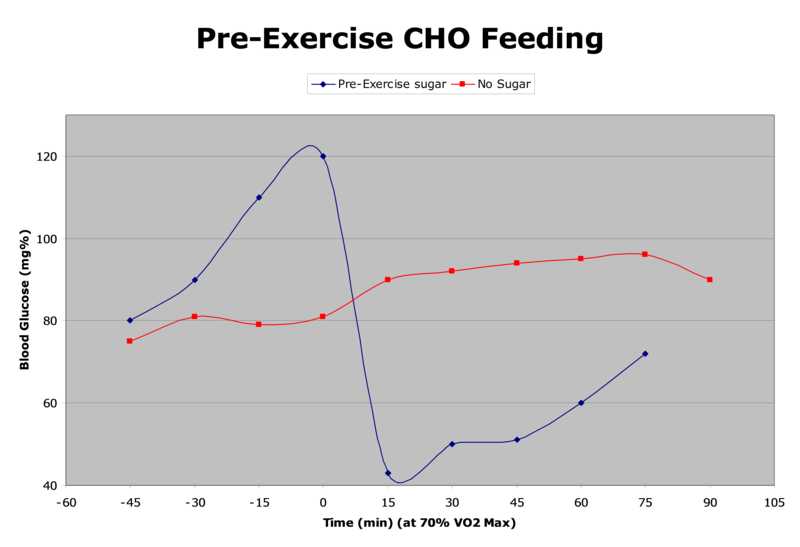 The sample group that took only water over the 60 minutes prior to aerobic exercise had a much more stable glucose supply available for use. Following the race, stabilize body temperature, fluid, and food in that order through a two mile cool down, 24 oz of water and sport drink and a meal within 2-4 hours of the race. Establish this routine start to finish for all of your cross country meets. Want EVERY cross country workout from June through Nationals? Click here!